You know what I hate? Complaining. Yes, I understand the intense irony of that claim, but it's absolutely true. I know that most of my blog posts are nothing but barely concealed rants about the smallest details relating to the series, ranging from complaining about swimming mechanics to lengthy tirades over a simple question, but that's not the kind of person I truly like to be. I don't like complaining about things I don't like, I think it's unhealthy for the mind to be focused on the negative. So in a daring move to free myself from these corrupting impulses, I spent the last few months meditating on any blog topic that would not revolve around some niggling little issue. So after that prolonged absence, I have returned with more minor issues to drone on about. 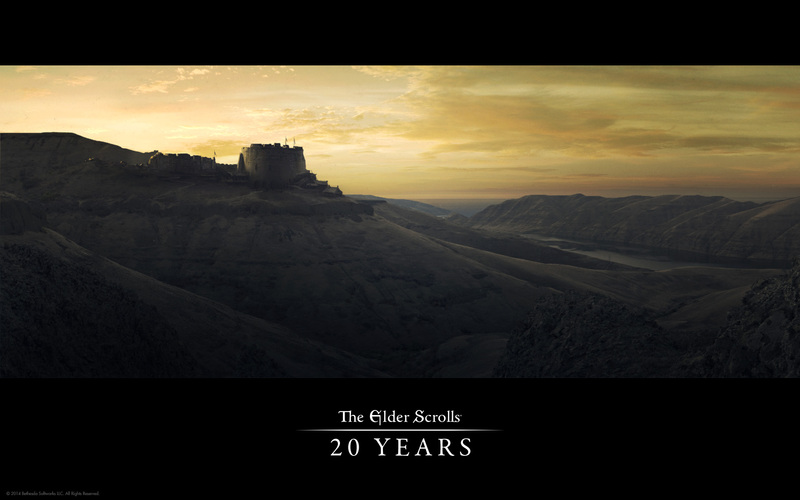 Today, specifically on my mixed feelings about the twentieth anniversary of the Elder Scrolls franchise. See the rest after the break. The new dye system seems to be receiving a generally positive reception from fans. Some payment complications have arisen for ESO subscribers which may force some to remain offline for a short time. ZeniMax is working to address the issue and has issued assurances that all affected players will get their full 30 days' worth of playing time. Update 4 has been promised for September (see the video below). Players will be able to continue the saga of Craglorn, this time in Upper Craglorn, where they will find a new Trial, group challenge, quests, difficulty modes, and the new Dragonstar Arena. At Raptr, a PC online gaming site which publishes the top 20 games their roughly 22 million users are playing every month, ESO dropped from #8 to #20 from May to June, evidently due to the release of the new Wildstar, and fell off the list in July. TES V: Skyrim has shown the opposite trend: it was not in the top 20 in May, then jumped from #19 to #14 from June to July. According to SuperData, there have been 772,374 subscribers to ESO as of June. If all of those subscribers renewed their subscriptions beyond the first free month, Bethesda and ZeniMax would take in $11 million a month. However, the number of subscribers who have opted to keep paying for the game has not been disclosed. The report also notes that ESO is challenging perceived market trends, as subscription revenue from MMOs has been decreasing since 2010, but they speculate that the influence of ESO has already caused other new releases to embrace a subscription-based model, and there will likely be more of them in the future. It remains unclear whether Bethesda and ZeniMax will maintain the subscription fee, but the online debate continues. Earlier today, Elder Scrolls Online was released on Steam with a half-off sale which will run until the end of the weekend. Expect more ESO news out of QuakeCon shortly. Update 3 is due sometime in August, and is expected to be very guild-oriented. 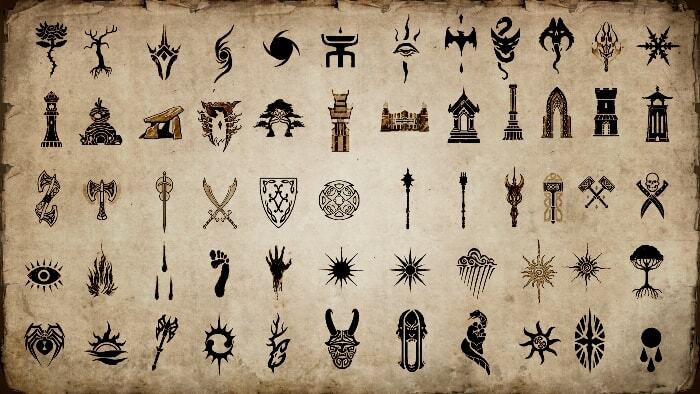 It will include an assortment of symbols from which guilds can choose their official crests along with other customization options, as well as new public traders in various cities which guilds can compete over. Pursuant to feedback, they also are working on making Veteran gameplay more friendly to solo players, and apparently have plans to eventually introduce a whole new Veteran system (something they've promised to talk about at QuakeCon). See the ZeniMax blog post for more details. For those who don't know, the game is set in the 1940s and early 1950s and is centred around protagonist Vito Scalleta’s return home to Empire Bay - a fictional city based on New York, Chicago, Los Angeles, Boston, and Detroit - following his service in the US Army during World War II. Upon returning home, Scalleta learns that his deceased father has left his family with a lot of debt to a loan shark and his forced to turn to his old friend and mafia man Joe Barbaro for ways to get work, leading to his involvement in the workings of the American Mafia and his becoming a made man. The story itself is not bad, but it doesn't particularly stand out in my mind, and Vito Scalleta is a rather emotionless man, who, despite the existence of a good potential backstory, just isn’t a very emotional or real character to me. He is just a man who can do stuff, and there is little depth to his character, making it very hard to relate to and appreciate him and what he accomplishes as the story moves along. That’s not to say he doesn’t have his moments, but they are too few and far between. This man has about as much emotion as Agent 47 does. While 47 is a cloned Assassin trained to be cold and efficient, Vito Scalleta isn’t. He’s supposed to have feelings, unlike the former, but they are so bland and uninspiring that they do nothing to further him as a character. He's simply your stereotypical "I'll do anything" Mafia man who loves beer and his family (both his blood family and the Mafia). On to the world itself. The world has the appearance of being open, with gas stations, diners, the gun store, and more showing up on the map, but in reality, the game is very linear, and you’ll visit these places very rarely. When you’re on a mission, you can still visit the gas stations to fill your car, you can visit clothing shops to buy outfits to wear in your home when you’re there to end a mission or start one (and to lose your wanted level if you get in trouble on the way somewhere), and so on, but otherwise, there is very little functionality to these places. That’s not to say you can’t free roam and explore. When you’re on a mission (each “Chapter” is a mission with a string of objectives), there’s nothing to stop you from just going out into the streets to shoot people, steal cars, get clothes, etc (unless it’s one of the few timed mission objectives), but it’s not the same as a true free roam, because you’ve always got a waypoint on your map saying to go do something, meaning you never feel like you can just relax and enjoy the bland city. If there is anything redeeming about the map and world, it’s the police and how they respond. I’ve always liked the idea of a game where the police actually gave a damn if you were speeding, and in this game, they do. You have to keep an eye on the radar for when a cop car is around the corner and slow down or tap your “Safe Driving” button (which caps the car at that street’s legal speed limit), and wait until he’s out of the way before driving recklessly again. Speaking of driving, there’s a lot of it in the game. I love driving around and exploring, but the massive city takes forever to navigate through, and the fact that there is nothing to do along the way only makes it that much worse. At least there is a decent sized soundtrack of period music that I’ve enjoyed listening to… Except for the part where is seems like Boogie Woogie Bugle Boy and Baby It’s Cold Outside are the only ones that are ever on at any given time when I play. The wanted system is pretty great. When you commit a minor crime like speeding, the cops will chase you to give you a ticket, and you can either slow down and pay it or evade them. And, with more serious crimes like homicide, when you’re wanted, you are wanted perpetually until you change clothes, meaning you have to break line of site and work your way to a clothing store where you can purchase an outfit to add to Vito’s at-home wardrobe, or run back to the wardrobe to grab clean clothes and clear it. The same with vehicles. If you’re wanted and you’re in a car, the car gets a wanted level attached to it, meaning you have to ditch it or take it to a body shop and paint it, change the tags, or otherwise customise it. Despite the reality of having a limited purpose, because you can’t free roam and there are no side missions to speak of , there are surprisingly a lot of options for car customisation, with two dozen colours to choose from, rim options, a license plate that can say whatever you want, and engine upgrades. The aiming, running, stealth, and cover systems are very much like a Hitman game, to use the Agent 47 comparison again… Meaning they aren’t very original or groundbreaking. You kneel behind cover, you swing your entire body out of cover to fire, and then you duck back. There was a slight learning curve to the controls in general, because a few of the controls didn’t feel like they were in intuitive enough places, but for the most part, it’s a playable game. Just don’t play this for hours and then move on to Grand Theft Auto, because they are different enough to confuse you when you play after a while. The controls and the remainder of the gameplay and story that I haven’t touched on have proven mundane enough that I can’t even motivate myself to write them out. And, what’s the deal with clothing in Mafia 2? Firstly, there are only a handful of options (admittedly they are all very mafia-esque, so they don't bother me personally to wear) and a handful of colours a piece. With so few and so uncustomisable outfits, why even bother having the feature? If I was scripted to wear certain outfits in each mission, it wouldn't bother me, but since a half-assed feature was implemented, I can't help but feel annoyed that the feature even exists. And, the main purpose for outfits is to clear your wanted level by changing your clothes... So, you buy an outfit or go to your home wardrobe. But, the purchasing of items is meh. I can draw my gun, shoot the wall or the cashier (more often than not it’s her, because those 40s hairstyles are meh), and I can just steal the stuff off the shelf. Honestly, what’s the incentive to spend money if I can get for free, shoot any responding cops, nick a suit to change out of my wanted clothes, then waltz out the front door? I only change my outfit to get un-Wanted anyway, so it's not like shooting a handful of more cops before nicking a suit is an unreasonable option to me with the COD-like health regeneration. Oh yeah, health regens on its own, but I'll let that point slide; this post is long enough already. For a final verdict, this is a rather mediocre game. It’s not the most amazing thing ever when compared to similar games, and the limitations imposed on the player coupled with the average story and character development will only give this game one or two replays before I set it aside and stop playing.